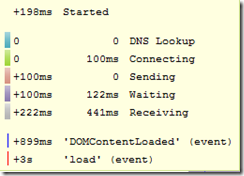 HTTP Optimization the easy way: Part 1, how do I know? Modern websites necessarily make a lot of requests for resources back to the server.Â Through books like those by Steve Souders we've become increasingly aware that each of these requests causes a delay in whatever it is your user has requested being downloaded and displayed. If you don't have both of Steve's books, get them...and spend an hour or two going through his site...it's awesome stuff. The term commonly used for the various efforts to reduce the number of requests made to a server is HTTP Optimization. This is a topic I've been investigating / playing with for quite a while (e.g., CSS Combiner / Minifier ASP.NET Control) and in fact one of the projects I worked on shortly before leaving the ASP.NET team morphed into the Sprite and Image Optimization Framework recently released as a preview by the ASP.NET team. What I wanted to do with this post wasn't to go over these techniques in any great detail...rather it's to cover some of the stuff I currently do when developing sites. 2. Make your web page really plain...no CSS / JS / Images...just plain old HTML; single request is always quickest - this is of course not usually acceptable! 3. Radically reduce the number of requests made to the server. 4. Make each request deliver more content for less bandwidth. Of these I'm going to take a closer look at the last two in more detail. The very first thing you need to do when trying to work out how to fix page loading issues is to actually identify those issues! I tend to use Firefox when I'm looking at these issues; mainly because it has an amazingly powerful tool in Firebug for debugging and investigating pretty much anything a web site does on the client. 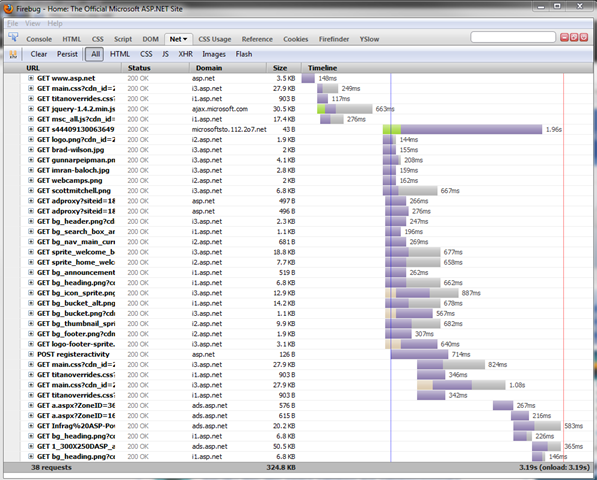 One of the most useful tabs in Firebug is the Net tab...in the image below you can see the result when I ran it with the home page of the ASP.NET site with caching disabled. 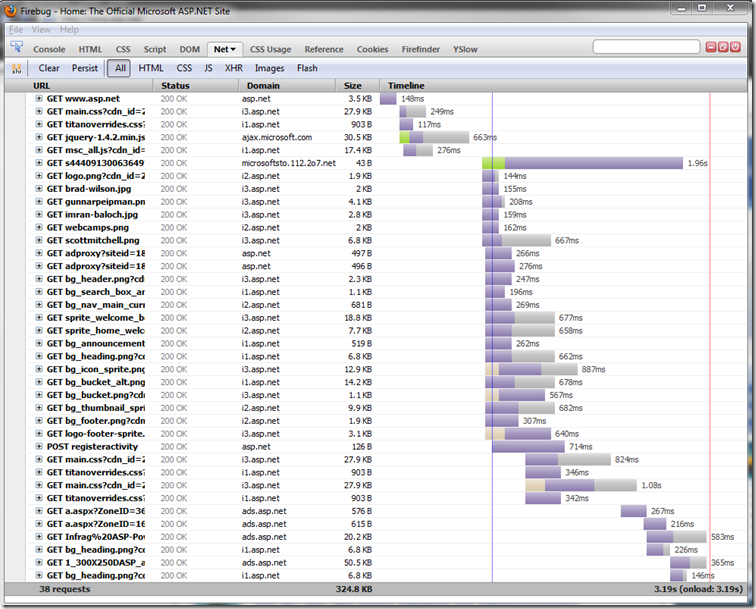 I'll use this page to point out some of the optimizations they've (recently!) 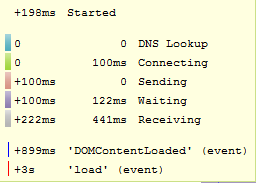 made to improve loading times for the home page of the site. 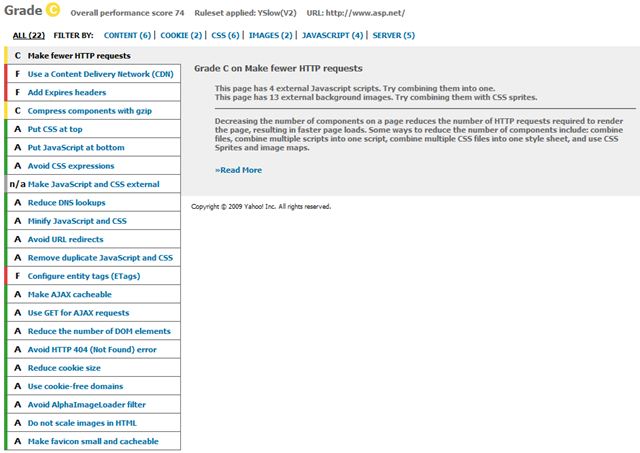 As you can see, YSlow gives a grade for a number of specific items which have proven to make a difference in page load time. Rolling over each one will tell you why they're important and give pointers. In fact, it even gives you links to tools which can help resolve these problems! So, great...we can now see what problems we have...and even have a way to fix them. However, what it you could avoid them happening in the first place? 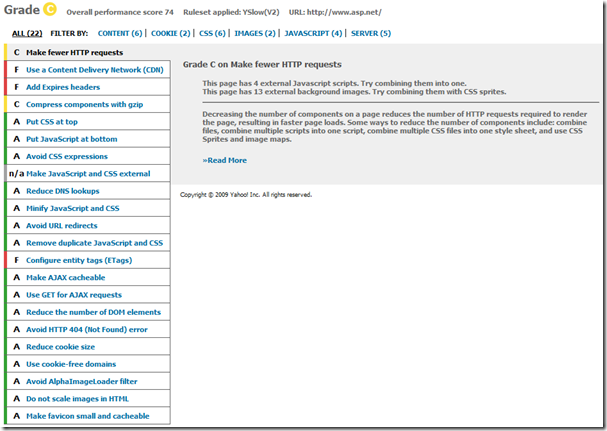 # re: HTTP Optimization the easy way: Part 1, how do I know? When I viewed this piece I figured Mostly Lucid's commenters just have to comment on this! http://hubpages.com/hub/rent-a-laptop-rentals . Renting a netbook makes no sense at all! The fees for renting a netbook even for a week or two is going to charge you as much as basically buying the notebook!